It is always a joy to meet the vendors who participate in the Hollywood Farmers Market. 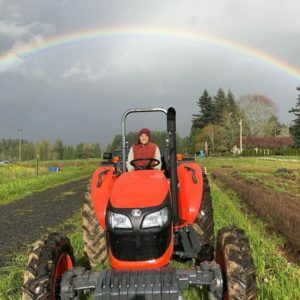 Lili Tova, owner of Flying Coyote Farm in Sandy, Oregon has already developed quite a following of regulars since starting at the Hollywood Farmers market in spring 2018. Born in Minnesota, her parents migrated to St. Petersburg, Florida and its warmer climate where at 16, Lili’s interest in gardening started to blossom. She loved the soil and felt a deep kinship with the earth. After attending a lecture by Gunther Hauk and hearing about his work on Biodynamics, Lili absorbed all she could about the techniques used. Her gardening became a form of spirituality and therapy. The principles of observing, sensing, and listening to the land are essential to Biodynamics. It is a system where the goal is to have all of the farm’s nutrients, fertilizer, and compost come from the farm, and all the organisms support each other, delivering benefits like healthier soil, better crops, and a more vibrant ecology. Natural ecosystems include both plants and animals, which work together to fill complementary roles in the web of life. Many conventional and organic farms only grow crops or raise livestock, and while this can be more efficient it creates imbalances such as nutrient deficiencies or pollution from excess manure. Biodynamic farms and gardens work to bring plants, animals, and the soil together in a harmonious relationship ─ supporting and balancing the whole. Lili’s passion for gardening in a sustainable and closed way continued to grow. St. Petersburg had a community very interested in gardening, but there was a lack of organic farms, natural food stores, and farmers markets, so turning a passion into an economically viable lifestyle was very difficult. And she knew her education was incomplete. So over the next few years, her journey took her to a farm in Applegate Valley in southern Oregon, then to California’s north coast to study herbalism and then back to north Florida to live in a radical land-based community. After 2 years of living in the community, Lili moved to Cottage Grove, Oregon to participate in a sustainable living internship at Aprovecho Research Center. Soon she was contributing to the community as a garden manager helping to administer the internship. It was here that she learned about the Center for Agroecology & Sustainable Food Systems (CASFS or the Center), a ten-acre farm managed by the University of California, Santa Cruz. This was the next stop in her quest for deep knowledge of the earth systems and sustainable farming. The CASFS’s mission is to research, develop, and advance sustainable food and agricultural systems that are environmentally sound, economically viable, socially responsible, nonexploitative, and that serve as a foundation for future generations. Lili then spent time on Winter Green Farm outside of Eugene. Winter Green is one of the foundational biodynamic farms in Oregon, and was instrumental in helping Lili learn how to use biodynamic methods on a large production scale farm. After crisscrossing the country and traveling up and down the west coast, Lili settled in Sandy, OR. Starting with growing vegetables and raising animals on a 2.5 piece of land purchased with her family she is now leasing 4 acres at Headwaters Farm, an incubator farming project of about 15 farms that helps with land, equipment, and infrastructure. Two years ago, Lili bought 37 acres down the road from her original farm and has plans to start farming the new land in 2020. During this time of exploration, discovery, and building her farm Lili said she couldn’t have done this without the support of her parents who now live in Portland part-time. Their emotional and financial support gave her the confidence to dive deeply into developing her passion. As a woman in agriculture and organic farming, rather than feeling alone, Lili said that in organic farming she found there are a lot of women doing things that are typically considered the role of men. Because of where her focus is, she has found it fairly easy to navigate the complexities. For instance, this year she started using a tractor for the first time and was amused when she took her tractor in to get fixed and the mechanic wanted to know where her husband was. Once she politely explained that it was HER tractor, there wasn’t any more discussion about ownership. In addition to an abundant variety of vegetables, she raises pasture poultry (used for meat only) and pigs which are locally butchered and sold by shares. In addition, several types of sauerkraut are produced on the farm. Produce and meats are sold through the Hollywood Farmers Market, CSA shares, as well as a robust restaurant clientele. To keep the farm healthy, crop rotation and cover crops are used as well as minimal rototilling, which can tear up the soil structure, destroying it over time. A power harrow is a way of bringing more respect to the land. The tool is minimally invasive and can actually help improve the condition of the soil. It is a perfect tool for shaping beds. The farm is cared for by 3 full-time employees in addition to Lili. This season, the goal is to employ an apprentice in the area of husbandry, another in vegetables, and a part-time person to help harvest. Being able to offer a sustainable living wage from the effort that the farm produces is becoming close to reality as the farm grows its land and customer base. When I asked about the name Flying Coyote, Lili said it came about when she started selling her own produce from a piece of land in northern California. She always wanted a name that spoke to more than just vegetables. Her dream has always been to operate a farm that included animals, perennials and value-added products. She likes the mischievous and playful energy of the coyote and the reference to old ranch names. When not farming, Lili loves to work with clay (guess she couldn’t get too far from the soil) and is installing a ceramics studio on the farm. She loves reading, taking workshops and cooking, especially during the cold, wintery months, and is sustained through a meditation practice. Taking getaways to other parts of the world during the winter months helps her experience new horizons and keeps her energized to continue doing the important type of farming that we need more of. Visit Flying Coyote Farm at the Hollywood Farmers Market for some of the freshest and most nutrient-rich vegetables!